Do you have a hot water tank and an immersion heater to provide hot water? Your solar panels generate excess electricity that is fed back into the National Grid if you don’t use it. Why not use this excess electricity to heat your hot water tank for free? The award-winning SOLiC 200 automatically diverts energy generated by a PV system into hot water by diverting surplus solar power to the immersion heater before it’s exported to the national grid. 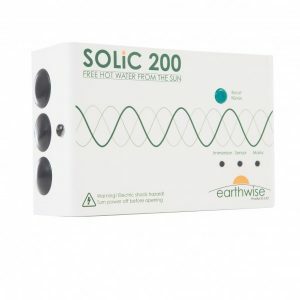 Simple to use and maintenance free, the SOLiC 200 is self-contained, easy to install and can save the homeowner hundreds of pounds over the course of a year. Use our Contact page to get your free quote and start saving today. We will get back to you with a price and best advice on your system. Let us upgrade your Solar System with this add on low cost energy saving product and start saving £££….